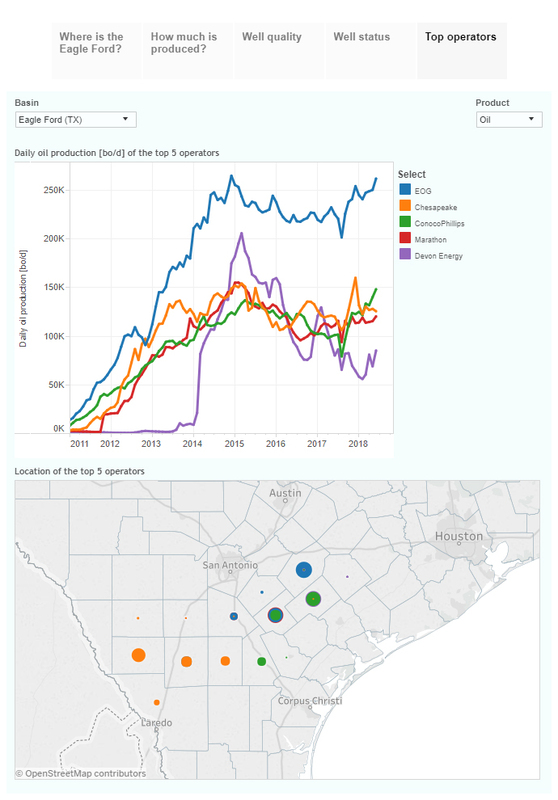 This interactive presentation contains the latest oil & gas production data from all 21,081 horizontal wells in the Eagle Ford region, that started producing since 2008, through June. 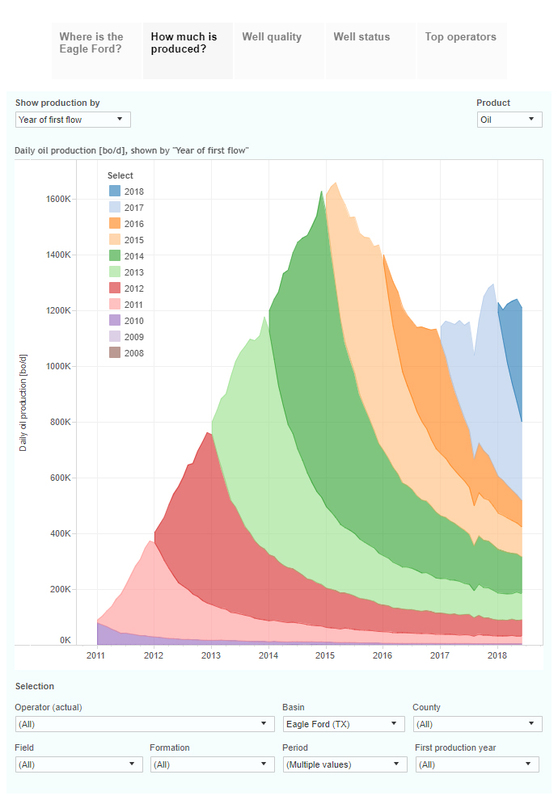 In the first half of this year, oil production from horizontal wells has hovered just above 1.2 million bo/d, while gas output stood at about 5.8 Bcf per day. Unlike the Permian, production growth is rather timid in this area. 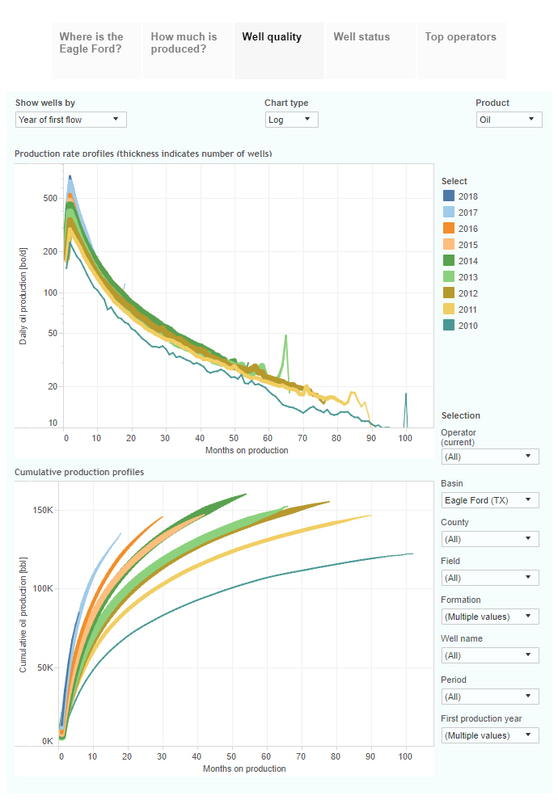 Although the ‘Well quality’ tab shows that well productivity has improved in the last couple of years, the rate of improvement is lower, and EURs are as well. That may be the reason that just ~80 rigs are drilling horizontal wells here, versus more than 400 rigs in the Permian. The final tab (‘Top operators’) shows that the 2 of the 5 largest operators, EOG & ConocoPhillips are producing at or near their all-time high. The 538 wells that started production in Q4 2017 are so far showing the best results; they have recovered on average 162 thousand barrels of oil in their first 7 months on production. 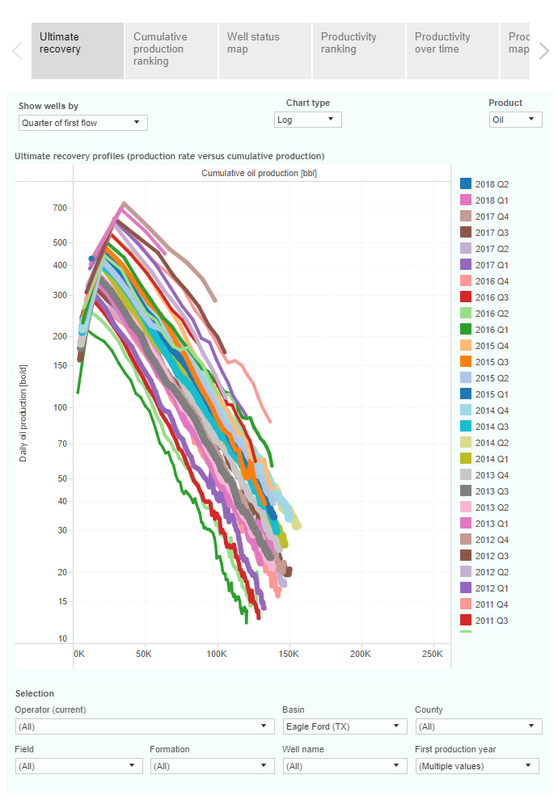 You can see that many wells (close to 80% of the total) are now below a production rate of 50 bo/d. Normalizing for the slight increase in average lateral length over these years (or the far larger increase in proppants per foot), this effect becomes stronger. Early next week I will have a post on all 10 covered US states.